JuVaShape works by using concentrated radio frequency energy to rotate water molecules in tissue. This rotation generates heat and friction causing volumetric contraction. To learn more about how it works see the Alma Lasers website here. 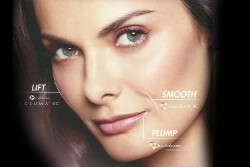 Dr. Meier has been working with JuVaShape and other brand treatments for over 10 years. If you live in the Denver area we recommend you book an appointment and see what types of treatment would best fit your needs. See our Medical Aesthetics page to learn about our other services.